BEFORE: After my very positive words about Johnny Depp’s performance in Donnie Brasco, this film was suggested to me as another good non-Burton and non-Pirates role for Depp. Added bonus: a young Leonardo DiCaprio. AFTER: I have three things to say about this movie: acting, acting, acting. The performances given by the cast were absolutely amazing. Leading off you have the wonderful Leonard DiCaprio who plays Arnie Grape. Now, I’m a sucker for characters with mental disabilities (Rodney McKay, Raymond Babbit, John Nash), but this is some great work by DiCaprio. I would say he deserved to win the Oscar for Best Supporting Actor but he was up against some tough competition that year, so I’ll hold off judgement until I watch the other contenders. Some other stand out performances include Darlene Cates who plays the mother, Bonnie Grape, and John C. Reilly who plays the local fix-it man, Tucker Van Dyke. 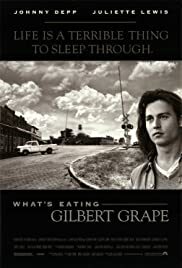 Johnny Depp as the titular Gilbert Grape and the rest of the supporting cast also gave some good performances but they were far out-shined by DiCaprio. As for the story, I’m less enthusiastic. There were a few underlying story lines (Arnie’s disability, the mother’s obesity) but overall it was just like random events of this family strung together in chronological order. The pacing and flow seemed more akin to a bunch of webisodes rather than a feature film. A perfect example of this is in a great scene where Tucker inspects the house supports after the mother’s weight causes the wood to crack. The scene itself was entertaining. You see the family sneaking around, trying to fix the problem without the mother finding out and there are some great reactions as Gilbert has to walk across the damaged parts of the floor. But that’s it. There was build-up to this scene when the mother stamps the floor in frustration, you see the broken wood, and then Tucker fixes it and the issue is resolved. For about fifteen minutes, the focus of the film is on this one issue and then they move onto the next part of the story acting as if nothing just happened. Superb acting, interesting characters, but a poor story.